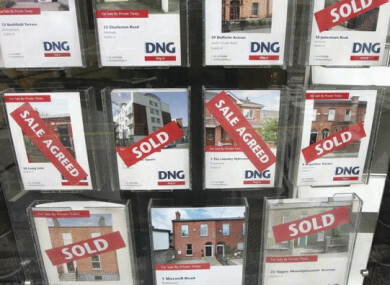 HOUSE PRICES ACROSS the country are rising by more than €50 a day according to the latest report from Daft.ie. The House Price Report has found that the price of the average house is now nearly €241,00 – 8.9% higher than this time last year. It means that prices have risen by almost 47% on average from their lowest point in late 2013. The best value for money is in Sligo where houses are around €134,000, while South County Dublin remains the most expensive with the average house costing €559,000. The annual rate of inflation in Dublin was 9.9% in the year to September. This is the second quarter in a row where it exceeds the rate in the rest of the country (8.2%). The rate of inflation in Dublin also exceeded the rate seen in each of the four other major cities for the first time since 2014. In Cork, the change in prices over the last year has been 5.1%, its lowest in over three years, while in Galway the figure was 9.2%. In both Limerick and Waterford, the rate was close to 8.5%, similar to the rate seen elsewhere in the country. There were almost 24,000 properties on the market on 1 September, 4% lower than the same date a year previously. Commenting on the figures, Ronan Lyons, economist at Trinity College Dublin and author of the Daft.ie Report, said: “The relaxation of the Central Bank rules on the minimum deposit would be expected to bring about a one-off jump in house prices, particularly in Dublin. “This appears to have happened in the first half of the year, when prices in the capital rose by 10% in just six months. Since June, though, prices have largely been stable, suggesting the change in rules has run its course. Email “House prices across the country rising by more than €50 a day”. Feedback on “House prices across the country rising by more than €50 a day”.